To begin my Formula 1 broadcasting blog, I thought it would be a good idea to write a five-part series looking at the new broadcasting deal in the UK that has come into force this year. The fifth and final part of the series looks at the effect the BBC and Sky deal has had on television ratings this year, in comparison to previous years on the first four rounds of the championship. For those unfamiliar, Formula 1 has been broadcast live regularly on terrestrial television in the UK since the late 1970’s. The 2012 to 2018 deal, which was announced last July, meant that only 50 percent of races will be broadcast live on BBC television. Since the 2000 Japanese Grand Prix, every race has been broadcast live on BBC1 or ITV1, or every race since the ill-fated 1994 San Marino Grand Prix if you ignore the 2000 US Grand Prix which was shown live on ITV2. Figure 1.1. shows the percentage of live races that have been shown on terrestrial television since 1992. 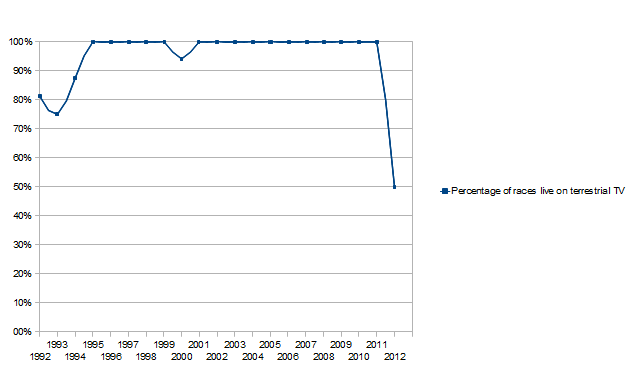 The graph shows that at no time since then onwards has the amount of live races dropped below 75%, until this year. In 1993, the year in question where the percentage was 75% – the 4 out of 16 races that were not shown were Brazil, Canada, Japan and Australia – the two American timezone races and the two Asian timezone races. Had this year BBC and Sky decided that Sky had all the Asian and American races (excluding Brazil), I think they would have accepted that – but as it turns out the contract stipulated that Sky gets the first three exclusive picks, with the picks alternating after BBC’s first three picks, meaning that they get some of the European races exclusively to themselves. In any event the 50 percent is the lowest percentage of races live on terrestrial TV since at least 1991 – although in reality it is probably the lowest since the early 1980’s. For those without Sky, you can understand their anger towards the deal given the above statistics. The ratings picture has been an interesting picture to follow for the past few years. As a Formula 1 fan, however, the trajectory the ratings have taken in this country in the past 15 to 20 years is probably an unsurprising one. Straight away, you can probably see where the ratings increased, and also where the ratings took a plunge. Although I won’t claim to have every single rating, see the note at the bottom of this post, you can make trends from the majority of ratings that I have. If you are to trace the graph over from 1992, 1992 was a high rating season with an average of over 5 million viewers per race, thanks to Nigel Mansell’s dominance in that season. With Mansell’s departure at the end of the 1992 season, figures in the UK plunged to an average of under 4 million viewers. This would turn out to be a ‘low level’ until the 2002 season. The emergence of Damon Hill though as a title contender, and the rise of German youngster Michael Schumacher, helped play their part as viewing figures rose from 4.1 million in 1994, to 5.3 million in 1996. That season, was also the last on BBC. The move to ITV in 1997, and Hill’s move to Arrows in 1997 meant that figures dipped (with longer airtime and adverts), but still stayed extremely healthy for the titanic title battle between Schumacher and Jacques Villeneuve, followed by the Schumacher and Mika Hakkinen battles in 1998 – the 1998 season claiming the highest ratings of the ITV F1 era. Further healthy ratings in the 1999 season followed, before figures took a nose-dive for 2000 and the start of Michael Schumacher’s dominance. From that point onwards, the viewing figures dropped each and every year until the emergence of Lewis Hamilton in 2007. The 2000 season on ITV1 averaged over 4 million viewers, whereas the 2006 season had under 3 million viewers. The lowest point of that year was when the 2006 French Grand Prix recorded an average of 1.8 million viewers, while the Italian Grand Prix only bettered that by 100,000 – these figures quite possibly the lowest figures Formula 1 had ever seen in this country. Why the turn off? At the time, there was no major British title challengers in the UK. Jenson Button and David Coulthard were there or there abouts, but neither looked realistic title challengers. Schumacher’s dominance ended in 2004, Fernando Alonso’s emergence in 2005 did nothing to help the ratings picture. The European rounds in 2005 averaged 2.9 million viewers, while the daytime rounds in 2006 averaged 2.66 million viewers. 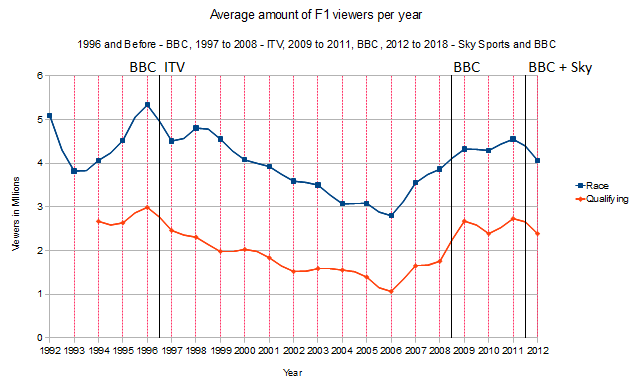 The 2007 season reversed Formula 1’s viewing figures trend in the United Kingdom, recording an average of 3.55 million. The title decider that season in Brazil recorded a mammoth 7.15 million viewers. The increase was only a sign of things to come however, as the 2008 season finished with a peak of 13.1 million viewers and an 8.8 million average for the Brazilian Grand Prix as ITV F1’s coverage came to a close. The average for Lewis Hamilton’s title winning season was 3.87 million, the highest average since 2001, and close to reversing the damage that the Schumacher years had done to the ratings. You may be thinking that the 3.87 million average is lower than that recorded in Damon Hill’s winning season, which recorded an average of 5.3 million. While all figures are for the programme averages, the BBC show was a lot shorter than ITV’s, hence why the 1996 figures are higher. But, the programme length since 1997 for ITV1’s coverage, and since BBC1’s coverage has stayed the same, so you can make valid comparisons. With the start of Formula 1’s new broadcasting contract in 2009, Jenson Button’s title winning year live on the BBC brought an average of over 4 million viewers per race, bringing with him the highest viewership in a decade – since 1999 to be exact. The lack of commercials and the BBC’s more compelling pre and post-race format and punditry will no doubt have also helped here. The winning streak of Hamilton and Button ended for 2010, as here comes the rise of another German. This one is called Vettel. Another plunge in ratings, I hear you say? Nope. An increase, rather bizarrely in fact. This is due to fascinating and close-racing in my opinion more than anything else, with Pirelli’s tyres, DRS and KERS becoming a hit with casual viewers, lighting up ratings. Moments such as Button’s overtake on Vettel in Canada last year have helped keep viewership high in this country. Last year’s viewership averaged 4.55 million, a fantastic figure in the multichannel television age, and higher than a ton of shows get today on terrestrial television. On the track, there was only one aim for Vettel. Just Drive. To make it to the line. First. Which brings the 2012 average to 4.07 million, lower than 2009 and 2010 but higher than 2007 and 2008. One final way to look at it is to bundle the average for the opening four races, after all if you remember China was only moved to the start of the season in 2009, which may complicate the picture slightly. You can’t go back further than 2004 as the Brazilian Grand Prix was one of the first four rounds, thus inflating the average. Although the figures are down on the past few seasons, taking it to not as low as the ITV F1 level but lower than the BBC F1 level. One thing worth noting is that the opening round in Australia did not do as well as in previous years, recording 3.31 million viewers on BBC One for the highlights and Sky Sports F1 live, the lowest average since 2004. Since Australia though, figures have increased to higher levels. If we are to look at the split for China, the only race where both BBC and Sky Sports were live, BBC live had 2.85m (39.4%), while Sky Sports live had 480k (6.98%). Both channels had a peak of 4.21m and 887k respectively. Once the BBC re-run is factored in, the averages work out at a total of 4.93 million, a fantastic figure. Although Sky, one might argue, only had 480k tuning in overall, I think they and BBC individually will be very pleased with the figures, Sky with their near 1 million peak for that race, and BBC with losing only 420k compared to the previous years. It shall be interesting to trace the picture over the next few months, but I don’t forsee any of the averages above overtaking the BBC averages from 2009 to 2011. I suspect the BBC average from 2011 will be the highest for several years and won’t be overtaken. Over the Summer, F1 will face incredibly tricky competition, with Euro 2012 and the Olympic Games in London meaning that you can expect the Canadian, European, German and Hungarian figures to record very low figures. Will F1 whether the Summer storm, or will the Summer figures sink below 3 million and without trace? Or will a competitive season keep viewers watching? Time, shall tell. This marks the end of my five part ‘The Verdict so Far’ series. I hope you’ve enjoyed the read. Although that particular series ends, this blog is only just beginning, so I hope you keep on reading. Comments, as always, are welcome! If anyone is reading and has any of them ratings, leave a comment. Sauber and Chelsea: Who benefits more?